Beauty Costs > How Much Does Eyebrow Threading Cost? 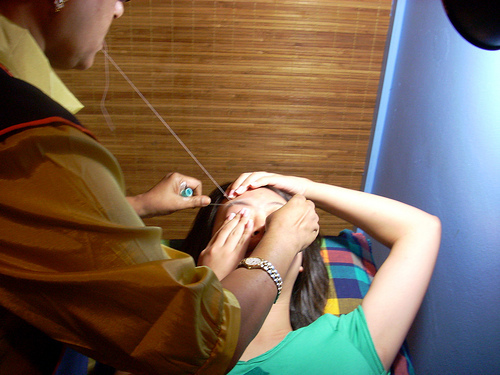 Eyebrow threading, a practice that originated in India centuries ago, is a precise technique that removes extra hair from the eyebrow and other areas of the body such as the upper chin, sideburns or upper lip. This technique involves twisting a cotton thread into a loop and rolling it against the skin, pulling out hair from the roots, leaving a clean, precise hairline in the process. Eyebrow threading is commonly used to elevate the arch of the eyebrow, eliminate a unibrow and/or enhance the shape of the eyebrow. It is a natural and safe beauty regimen as it does not involve any chemical-based application like depilatory creams and wax does. On average, eyebrow threading can cost anywhere from as little as $6 to as much as $25. The cost will depend on where you live, where you go and the skill level of the professional. At Hollywood Beauty Eyebrow Threading in Texas, they charge $8 at their local store and no appointment is required. During the process, an esthetician will use a cotton thread to remove the hair from the root from the eyebrows, creating a shape as desired without using any chemicals. A good session can take about 10 to 30 minutes, depending on the amount of hair that needs to be removed. Post-treatment creams and applications are available to help soothe red bumps and prevent the growth of ingrown hairs. These post-treatment creams, if needed, can cost $10 to $25, depending on the brand and where they are purchased. Redness and/or swelling may occur, but most of the time, it will subside within 30 minutes. Gratuity, usually 10 to 20 percent of the total price, is recommended. Depending on how fast your hair grows back, experts recommend coming back every three weeks for desirable results. Some states do regulate this practice, so if you come across a professional for the first time, see if they have to be registered by the state. As for pain, threading is often compared to a slight burning sensation for up to five seconds, but some people claim it doesn’t hurt at all while others say it can be uncomfortable for a few minutes. If you can handle plucking your eyebrows, then you will be able to handle a threading session. Threading is considered to be a better option than waxing due to the lack of chemicals often found in wax. As mentioned, since threading only uses a pure cotton thread and nothing more, it’s a great alternative for those with sensitive skin and lasts much longer than waxing since it removes the root of the hair. As mentioned, wax often uses harsh chemicals, such as resins, artificial fragrances, dangerous dyes and carcinogenic parabens, that are bad for your health. With threading, the removal only uses a cotton thread and nothing more. Those who have sensitive skin often struggle with hair removal due to the chemical reactions mentioned prior. Aside from waxing, even depilatory creams and tweezing can leave sensitive skin raw or inflamed. With threading, again, it’s all natural, meaning there’s very little contact with the skin, ideal for those who find no other hair removal methods working for their situation. Threading, when compared to waxing, is much faster than plucking or waxing. Instead of grabbing an individual hair, threading can grab an entire line of hair at once, speeding up the process. Waxing not only doesn’t last as long, it can be painful and even some of your unwanted hair, along with your skin, can be removed. Threading has been known to last longer and even be less painful. Check out Groupon.com as they always have daily deals for local spas offering eyebrow threading sessions. At the time of this writing, for example, we had found deals as cheap as $5 after using a coupon code.